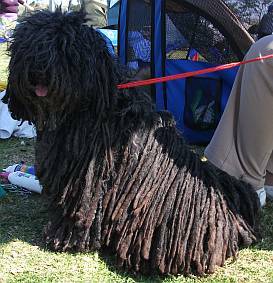 The puli (pronounced pulley) originated in Hungary where they were used to herd sheep or cattle. The dogs had to be tough to lead an outdoor life. The puli guarded its flock loyally but once the puli raised the alarm if a wolf came near, a larger dog like a Komondor would do the attacking. The dogs are nimble and can change direction effortlessly. 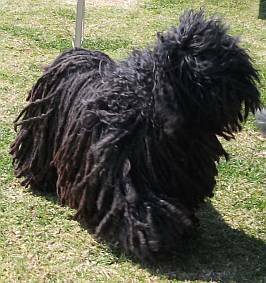 The puli's long coat hangs in dreadlocks - tight ringlets of curls resembling strands of wool. The hair sometimes hangs down to the ground. The tail curls over the back. The corded coat keeps the dog warm in winter and cool in summer. If the dog gets wet it takes hours to dry with a dryer, and days without a dryer. So you may not want the dog to have access to a swimming pool. A wet woolly coat is unhealthy for the dog. 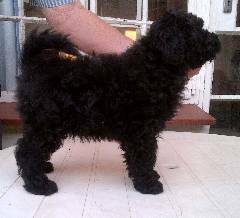 From 6 months, a puli puppy's coat starts matting and it should be teased apart by hand into narrow strands. This should be done regularly. The dogs don't shed their coats, which may be good news for folk with allergies. 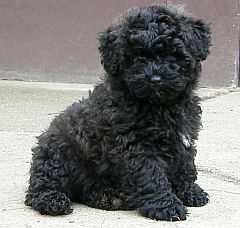 It's hard to see the dog's eyes & ears amidst the long curls, but do check your puli's eyes and ears regularly. Colour: black sheepdogs were popular in Hungary, but other colours exist, eg white or grey. Pulis (or pulik plural) are happy, playful, non-aggressive dogs. Size: medium-small, with a squarish shape. Height at shoulder: males 41- 46 cm, females 36 - 41 cms.